There’s a current vogue about tidying up and decluttering one’s home or life. But sometimes, writers also need to do some decluttering to make reading easier on their audience. Clutter happens when writers use phrases, sentences, paragraphs, etc. that don’t add value to a story or message. Decluttering your text means saying only what’s necessary to convey your message. The more concise you are, the easier it will be for your readers to get it. Don’t repeat the same point over and over (get it?). State it once, add details if appropriate, then move on. If any readers are confused or miss your point, they can go back and read the text again. There’s no need to say keep repeating it. Work hard to pare your text down to the basic message. It can really help to have a writing plan, such as a detailed outline. Following that plan can really make writing straightforward, efficient, and effective. 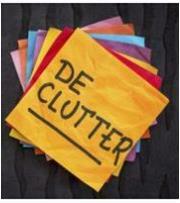 When you wander off course, it’s likely that you’re adding clutter. When you finish the first draft of your writing project, look for filler—words, paragraphs, or more—that doesn’t add anything to your story or message. What you want is less filler and more substance. Long sentences with multiple points tend to lose readers. That’s because, in today’s world, readers tend to scan. Instead, use short direct content-filled sentences that are grammatically correct and easy to read. Another idea is to use bulleted or numbered lists. But some people are annoyed at a break in text flow, so use this technique when it fits the subject material, and use it carefully. One wonders how many pages Charles Dickens’ book David Copperfield would be if he had practiced decluttering his writing. Clear, succinct text wins every time.